Two things I love and know a fair amount about are books and beer. I was thrilled to find out about Colorado’s Fiction Beer Company, a Denver craft brewery that combines these two passions. I reached out to Fiction and had a lovely conversation with co-owner Christa Kilpatrick (with a few answers coming from Ryan Kilpatrick, head brewer and Christa’s husband). After you read the interview, be sure to check out Fiction Beer Co.’s social media links at the bottom. 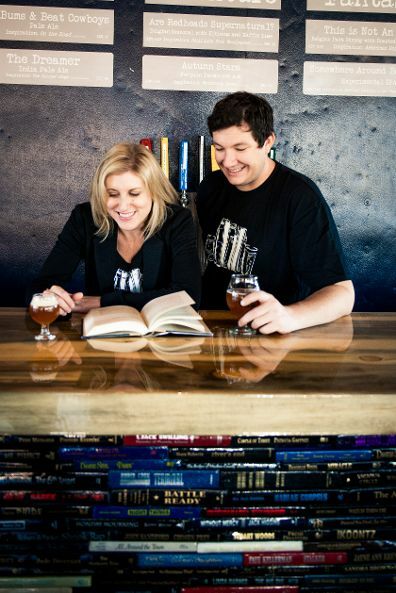 David Nilsen: How did the idea come about to combine books and beer at Fiction Beer Company? Christa Kilpatrick: During the process of developing Fiction Beer Company Christa came up with idea to combine two of the things we love most; books and beer. 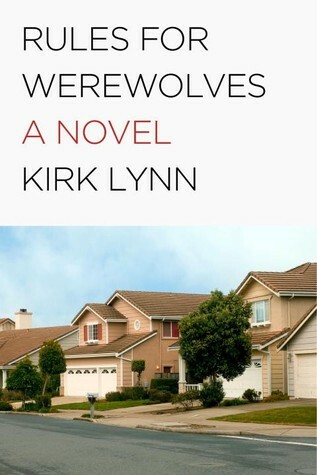 Christa loves books and likes beer and Ryan loves beer and likes books so what better than to put the two together? We find limitless inspiration using books to develop beer recipes and have a lot of fun pulling language, themes and settings out of books to use as beer names. David: Tell us a little about the “genres” you divide your beers into. What makes a beer a Science Fiction title, or a Mystery, etcetera? Christa: As a way to play with our theme a bit we decided to categorize our beers into Classics, Adventure, and Fantasy. Classics are the everyday beers, the standards you may know. Adventure is for our seasonal beers; these beers use a variety of seasonal ingredients (we find that using ingredients that are currently in season in Colorado make for the most flavorful beers—our Somewhere Around Barstow 1st Edition used cantaloupe that was at its best in August and the result was a delicious beer) and span all styles of beer. Fantasy beers are those that are of an experimental nature including sour beers, wild Beers, or beers with new processes or unique ingredients. David: How does the idea for combining a specific literary title with one of your beers happen? Does a book inspire a recipe, or does a finished beer provoke a connection with a book? Christa: It can go both ways. Sometimes we have a great book we want to use, so we talk about what might be a good beer to make. Sometimes we have an idea for a beer and think about what book might complement it. Often, reading a book might evoke a certain setting and we imagine what sort of beer we would be drinking if we were in the book. (Our salted caramel Wee Heavy inspired by Sir Arthur Conan Doyle’s The Hounds of Baskervilles is a great example of this.) The book and beer connection is occasionally obvious and more often than not, it’s more subtle. We have a rather wordy beer menu that describes the book and beer connection in detail to help our customers see what we were thinking. David: How is the literary theme of Fiction Beer Co. incorporated into the customer experience at your brewpub? Christa: Everywhere! 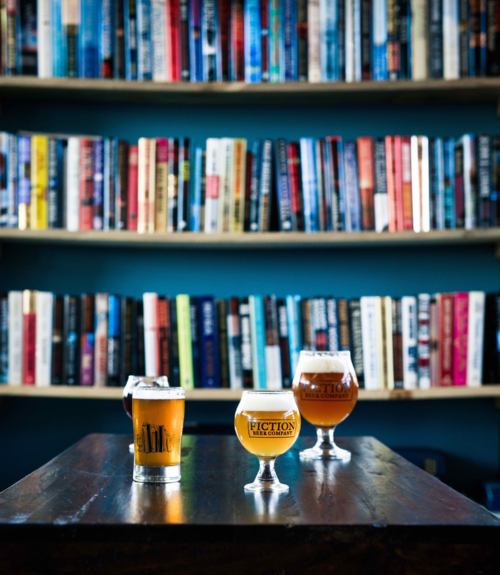 When you walk into our taproom the first thing you see is our bar made out of actual stacked books. You might then notice our large floor to ceiling free book exchange. Our menu board uses magnetic signs with the name of each beer and the book/author that gave the inspiration. Our paper menus have lengthy descriptions for the beer and books that provided the inspiration. Our sample flights are categorized by “series” for 3 samples; a “collection” is 5 and “magnum opus” is all 8 beers. We had our favorite book quotes lasered into our wood tables. And lastly, many of our staff members are serial readers and we even have an ex-librarian on staff. David: I understand you did a collaboration beer with Denver Public Library. Can you tell me a little about that? Christa: We are very lucky to have a bit of a librarian following. One of our favorite librarians (Tara) whom works at the branch where Fiction Beer CO and our home are located reached out to us about doing a collaboration brew for their Brew HaHa! Program. Basically, it was a month-long celebration of brewer culture. Tara then had the brilliant idea to get a local author involved in the beer collaboration as well … and Iron Druid Chronicles author Kevin Hearne joined us on the beer collaboration. We chose to brew a cream ale with caraway and pear in honor of the book and the Denver Public Library. I have attached the press release for your perusal to save me some time in rehashing all of the details. David: Which is your personal favorite book/beer marriage in the Fiction Beer Co. portfolio and why? Christa: “Feely Effects” our Green Tea Milk Chocolate Stout inspired by Aldous Huxley’s Brave New World. This was one of our very first beers we brewed and the first beer we bottled and distributed and it happens to be my favorite. The ingredients are rather unique (okay, weird) but the flavors meld deliciously together! And while re-reading Brave New World for the first time since high school, I really enjoyed the description of the “feely” movies and instantly made the connection to this beer. Ryan Kilpatrick: “Waves and Ripples” our Gose inspired by Neil Gaiman’s Ocean at the End of the Lane. The combination of a whimsical tale and a flavorful easy drinking beer make for a great pair. The lightly salted malt profile balances the tart spicy flavor and aroma. The low alcohol keeps this interesting beer drinkable all day, or at least until you have finished the book. David: Can you let us in on any of your upcoming literary brews? Christa: We almost always have something new in the works. On Friday 10/09/15 we will release “Twilight Superstition” a Sour Pumpkin Brett Saison. In early November we will release our second bottled beer: a Holiday Ale inspired by A Christmas Carol. In late October we will release our new double IPA inspired by the Electric Kool-aid Acid Test. We also have several other author collaborations planned or being explored (we are currently working with local author Gregory Hill to get a collaboration beer cooking). David: What are you currently reading? 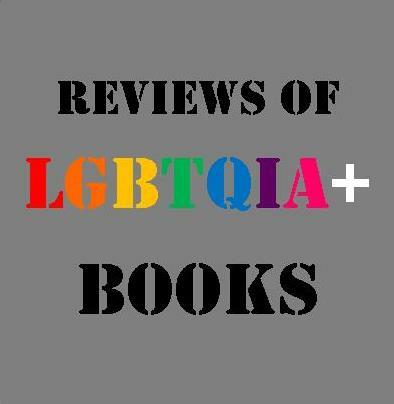 Ryan: The Subtle Knife by Phillip Pullman (though I would say Ryan spends most of his time reading brewer publications – Christa). David: Finally, the most important question – Is there any chance you’ll be distributing to Ohio any time soon? David: Thanks so much for talking with us! 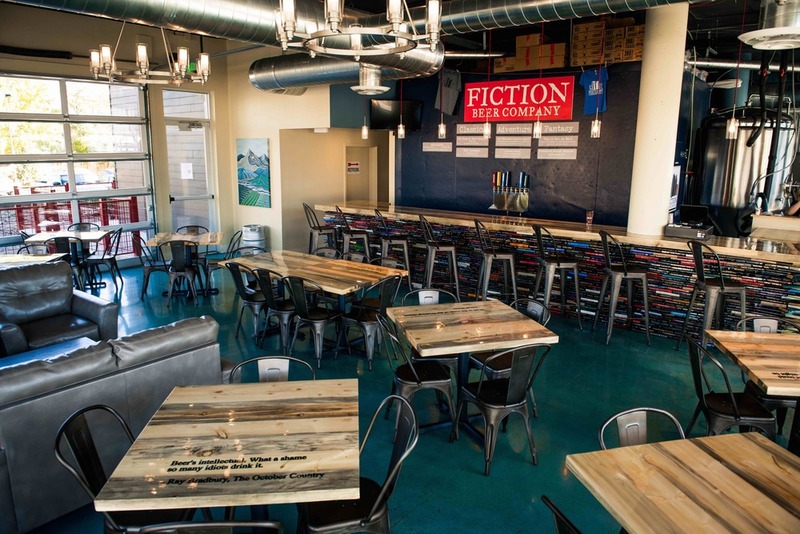 If you’re every in the Denver area, be sure to stop in and try Fiction’s literary brews! I live in Denver and never heard of this brewery. Thanks for the tip. 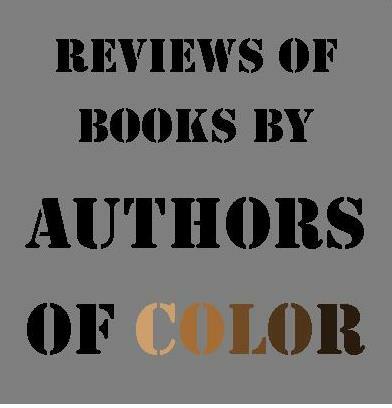 It is a little strange that an Ohio author/blogger got there before I heard of it. Good job!